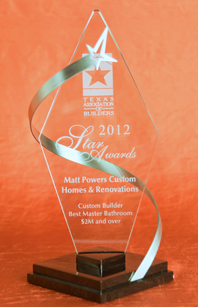 Winning a total of 11 prestigious industry awards in 2012, the Matt Powers Custom Home Team looks forward to introducing new homes into Lagos Woods, The Estates of Auburn Lakes, and Shadow Creek Estates in 2013. Matt Powers announced that Matt Powers Custom Homes & Renovations recently received four prestigious awards to cap off a great 2012: the 2012Texas Association of Builders “TAB Star Award for the Best Custom Master Bathroom Over $2M and Best Print Ad “Discriminating Taste” in the Custom Builder Category;a Silver Award in the national 2012 Dream Home contest for the Best Custom Home; and a Silver Award during the 2012 national Professional Remodeler Design Awards contest in the Green Remodeling Category. “We are excited by the great year have experienced and thank our homeowners who allow us to be on their team! Building or renovating a home is an occasional life event that needs to be exciting and fun. We are a trusted advisor, experienced professional, and loyal friend available to share this building experience,noted Powers. “We are honored to receive these awards, which speaks highly of the talent, expertise and excellence of our team.